The Empress is an impressive building in a very nice area. It has one reasonably large room to drink in. The ale range was ok, without being anything special - Wells Bombardier, Timothy Taylor Landlord, Tetleys Bitter & Daleside Blonde. As 'strangers', we did get a few strange looks. But that can happen anywhere. What can I say that oldboots hasn't already said. Daleside Special was on tap rather than the bitter when we called. The Daleside Blonde was in very good nick. Has a large tropical fish tank at the opposite side of the pub to the pool table. It's a nice pub. Full name "The Empress on the Stray". 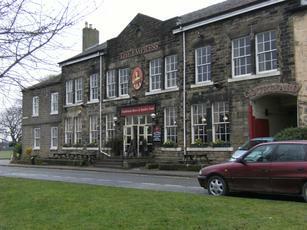 An imposing pub on Harrogate's much revered �Stray�, a parkland around part of the town centre. A tasteful fake victorian interior, the pub is not as posh as the decor might suggest. Four hand pumps dispensing John Smith's Cask, Tetley's, Daleside Blonde and Bitter; a wide range of kegs. Beer is competently kept. Friendly and efficient staff, mixed but generally middle class customers. A pool table occupies one end of the single large room, there are two exterior doors. Reasonably priced food available, puddings are shown on the 'Naughty Board'. A bit of a walk from the throbbing heart of Harrogate in the Parliament Street area.